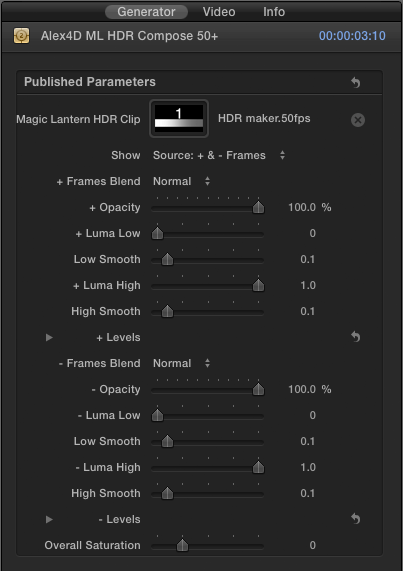 I’ve updated my Magic Lantern Compose Final Cut Pro X generator. November update: The 10.0.6 update to Final Cut Pro X has broken these generators – they only work in 10.0.5. This is because the way motion templates handle drop zone clips has changed. Sorry! Magic Lantern is a system for adding features to Canon DSLRs, Unified is a recent ML package enables some cameras to shoot footage that can processed to produce content with a larger exposure range – i.e. High Dynamic Range. The files produced are made up of alternate frames of under- and over-exposed footage. The generators take these frames and give you better control over how these frames are combined. Note that you must shoot footage at twice the framerate you need, as 50 fps footage results in 25 fps HDR footage. These generators don’t do any interpolation. Once you have MTT installed on your computer, double-click the ‘Install Alex4D ML HDR Compose+ 1.0.mtt’ file. 1. Start Final Cut Pro X, add your HDR footage to an event. 2. Create a new project at the native frame rate of your footage – 59.94 or 50 fps, or half the frame rate of your footage – 29.97 or 25 fps. 3. Add your ML footage to the project. When you release the mouse button, a pop-up menu will appear. Choose ‘Replace from Start’. 5. The ML footage isn’t automatically added to the generator, so you need to click it, click the clip well and choose your ML footage. The default setting is to show the source frames: the interleaved over- and under-exposed frames as produced by Magic Lantern. You can display the + or – frames only: before and after processing. You can choose to compose the + frames over the – frames, or the – frames over the + frames. The processing you can perform on the frames is choosing blend mode, overall opacity, luma key and RGB levels. The luma key controls allow you to select which parts of a frame are used based on their brightness. If you increase the value of Luma Low from 0, the darker parts of the frame aren’t drawn. If you decrease the value of Luma High from 1, the lighter parts of the frame aren’t drawn. The levels controls are the same histogram controls over overall brightness, contrast and gamma. There is also an overall saturation control that is applied after the other effects. 7. If you use the 50 fps version in a 25 fps timeline (using 50 fps ML footage), or the 59.94 fps version in a 29.97 fps timeline the Show menu cannot display all the source frames, but should work otherwise. Check out my other free effects and articles on my Final Cut Pro X home page. Awesome thanks for the update. Since the ML update last month, been looking a lot more into this and planning to use it for some shoots. This definitely makes the workflow much easier than having to split the frames in a 3rd party software. Alex if I’m planning to shoot some HDR footage that’ll end up in 23.98 for the states, will this plugin work? Or will there be a future release to cover that? Thanks again. Given that HDR works best at frame rates at 47.95 fps and above, what frame rate can you capture at? I was thinking about using Magic lantern’s fps override to capture at 48fps. Seems like the best bet when working on a 23.98 workflow. What are your thoughts? Thanks. Hey Alex. Is this possible as an addition to be able to work with a 23.97 timeline? Thanks. Hi Alex, am not able to install the HDR generator in FCPX. Any help please. Thanks for the work. Which install methods did you try? Did you download MTT or install to the folders directly? thanks for replying back. I went through MTT…downloaded it…and after installation launched with the two programs. I opened FCP X but could not found Alex in effects folder. Or am missing something with MTT? Please advise. Thanks dear. Once again I want to thank you heartily for the beautiful work you do and free for everyone. How to proceed to install directly to the folders? 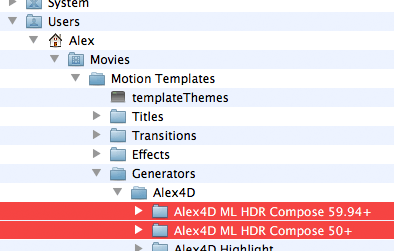 If you’ve downloaded MTT, double-click the ‘Install Alex4D ML HDR Compose+ 1.0.mtt’ file. 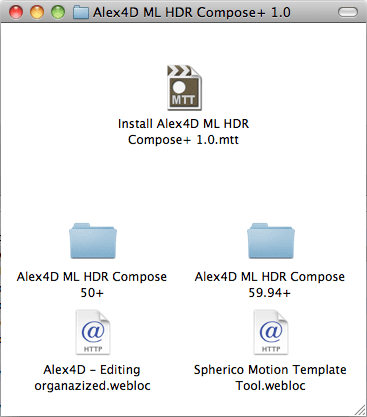 Or create the folder hierarchy shown: Your startup drive name / Users / Your user name / Movies / Motion Templates / Generators / Alex4D and put the ‘Alex4D ML HDR Compose’ folders in the Alex4D folder (as shown in the screenshot above). Hi Alex have installed the new generator but every time I click the clipwell FCPX (version 10) crashes any ideas? Sorry, no, because it doesn’t crash on my Macs running OS 10.6.8 or 10.8.2. Make sure the version of Final Cut Pro X is 10.0.5. Wondering if anyone else has noticed this? Can anyone confirm if this works with FCPX 10.0.6? Using the default settings my final clip appears no different to the source clip. Looks like 10.0.6 has rendered this plugin useless. Yeah, I just shot something using the HDR ML option and the plugin seems to be broken in FCPX 10.0.6. Was working fine before. Hope, you’re able to fix ti. Thanks Alex, keep up the great work!!! After spending the last couple hours tweaking with the program, I’m still getting the constant blinking in FCPX 10.0.6. Like a lot people, I captured at 30fps – 1080p on a Canon T3i. My project is a 30fps project, and I dropped the 59.94 Generator over the clip in the timeline. Would appreciate a tut watching someone going through step by step in FCPX 10.0.06. Thanks! Really great work, I have the same problems with it, not working in FCPX 10.0.06 – can you give a hint, if you are going to look into it? I did spend a few hours taking a look at it. As well as drop zone clips working differently (the time in the source clip you click sets the offset of which part of the source clip is used in the generator), it looks like the Motion playback part of Final Cut now works differently. I may have to build up the core part of the generator from scratch in the coming weeks. Hope you can fix it for 10.0.6… really a donation worth! This makes so much sense now… i started using this plugin just after the 10.0.06 update came out and i could never figure out why it wouldn’t work. Looking forward to seeing a fix for this! Totally worth a donation! To fix the fault introduced by the 10.0.6 update, I’ve created a single effect that replaces my ML HDR Compose generators. Go to https://alex4d.wordpress.com/2012/12/18/alex4d-fcpx-magic-lantern-hdr/ to find out more. Many thanks for this update. I tried with FCPX 10.0.7 today and it seems to work well.